This is Annabelle, the 2 year old Persian mix we rescued from the local animal shelter. She is an expert mouser and a complete joy to have around! I've wanted a cat for ages now and knew we'd find the right one at the shelter, even if it took awhile. I walked past her 5 or 6 times; they had her in a bottom cage and she was hiding in the corner. She'd been there a week when we got her, which completely shocked me as she is the most beautiful cat I've ever seen! Anyway, she's found her forever home now! She is beautiful! What a funny spot she has found to curl up in. I can't believe she was in a shelter. 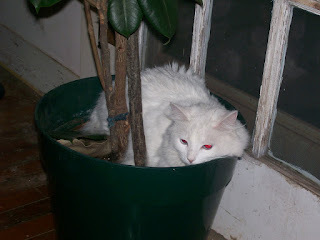 I had a white cat years ago- he was deaf. How sweet! She will enjoy all the love your family has to give, I'm sure.